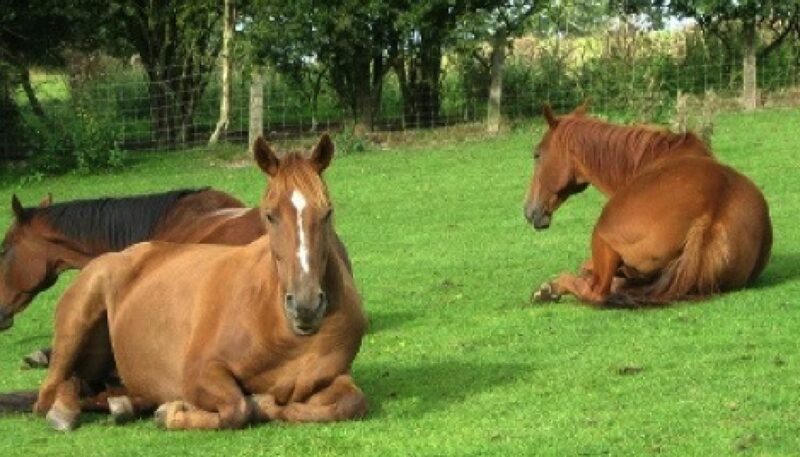 I recently found this powerful account of what can happen when horses are allowed to assist with grief and healing, from Angela Dunning in England. It describes what can happen for women at Riding Beyond. It is an eloquent description of the aspects of the horse’s large heart which engender unconditional love, compassion, and a healing presence, revealing the innate harmony in all things, even the most difficult. Joy abounds. The healing power of grief and tears. A few years ago I had an experience with my then herd of horses which stays strongly in my memory to this day. The pressure had been building steadily in me, weeks if not months of tension. I was feeling physically isolated and the constant financial pressure involved with running a business single-handedly was getting to me. I was gradually finding the simple daily tasks of looking after the horses like giant mountains to climb, whilst simultaneously needing to be fully present and calm for my clients, no matter what I was feeling. Anyway, one day the wind was blowing hard up on the hillside where the horses lived, the electric fence was down, again, and I was once more alone trying to rectify all around me. Then suddenly, something in me gave way. I had reached breaking point inside. After this had gone on for some time, I started to slowly become aware that I wasn’t alone. The next thing I felt was a gentle warm breeze on my legs. Slowly I opened my sore, tear-filled eyes and was amazed to find my entire herd had come over and had surrounded me. My two beautiful chestnut mares were standing either side of my legs. LP, the gentlest of all horses, was softly breathing on my bare legs. Each deep long breath was pouring out of her nostrils onto my skin and into my body. My other mare, Connie, normally quite a handful and not the calmest of horses, was now standing the other side of me, her head hanging low, her breath deep and long too, as quiet and as gentle as she could possibly be. My amazing, powerful gelding North Star, who was the herd leader and not a horse to suffer fools gladly, whether equine or human, was standing in front of us, like a guard, keeping watch and keeping us safe. Gradually the sobbing and involuntary jerks in my body started to slow down. I managed to sit up and I wrapped my arms around my knees. As I sat there, trying to breathe more slowly, and allowing the horses to hold me in their total loving embrace of peaceful protection, something strange began to happen in my body. I could feel myself start to sway and rock from side to side. I began to wonder: Was I doing this? Was I moving my body? But no, I realised my body was moving itself! And furthermore, I could not stop it. Able to trust now in the wisdom of the body and of the horses as powerful healers, I decided to let go and let my body do what it needed to. As I sat there, I literally became aware of my energy running through my veins. And then, incredibly, that this energy was changing before my very awareness. I realised I was experiencing a major clearing out of old stuff and a major replenishment of a different kind of energy in my body. It was as if an energetic re-balancing or regulation was taking place. Something so big had shifted in me and an invisible force, which I suspected was coming from my unconscious, with the help of the horses’ energies, was taking over and doing its work. My body continued to rock back and forth, and side to side, for about 20 minutes. Then gradually it slowed down until eventually coming to a peaceful stop. The horses stayed exactly where they were the entire time. Just standing, peacefully and contentedly. I began to yawn and focussed on noticing what this new energy inside of me felt like. I felt calm. I felt at peace. I felt cleansed. I felt lighter and I felt so utterly loved. My horses had held me in their invisible arms, like a mother might hold her distressed baby. Gently rocking it back and forth until the uncontrollable sobs dissipated and her baby once more was at peace. North Star, lifted his head a little, taking in the change of energy surrounding all of us, then lay down himself, followed soon after by each of the mares. All four of us rested side by side. My eyes and awareness more clear now, I looked at the stunning view of the range of hills opposite and breathed deeply and slowly. I left the field that day changed. I had released some deep-seated grief that I held onto since I was very young. My body and heart felt different. I felt new. I felt tired but also reinvigorated. I also left with no uncertainty about the alchemical power of horses to help people heal. To let old wounds be revealed and released, thereby allowing the powerful healing energy of total love to pour into us from their enormous, generous hearts. I teach people on my Equine Facilitated Learning courses about the immense power of the heart. I give them the facts that the energy field of the heart is 5000 times greater than that of the brain. Now multiply that to take into account the difference in physical size of horses and people and you get an idea of just how big and loving horses’ hearts are. That day in the field with my own horses I was healed of part of that particular pain. The source of my grief came closer to my awareness, rather than languishing in a deep, dark well underground, and my tears cleansed and revitalised my entire system. The beautiful and healing part of equine facilitated learning and therapy is that, unlike many people, horses don’t steer clear of strong emotions. In fact, the opposite is the case, every single time.